Our six evidence informed pedagogical principles. Aspects of cognitive science, brought to life by the Learning Scientists. We did the same at our INSET day today. Our teaching and learning focus hasn’t changed and won’t – gone are the days of flitting from one topic to another. 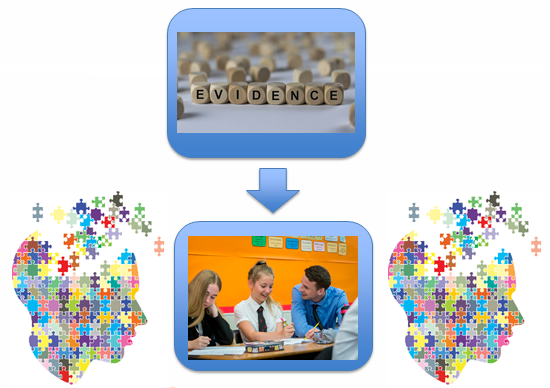 Four teachers shared approaches they had been trialling in their classrooms, summarised below. 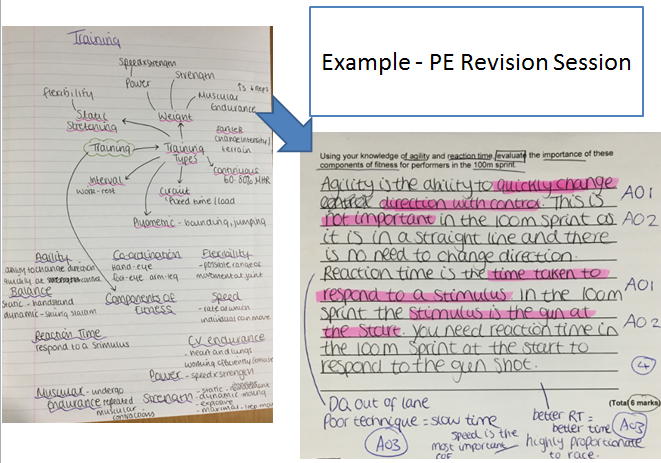 Providing opportunities for students to practice retrieving the knowledge that they need during the revision session, often by using mind-maps. Once they have done this, deepening their understanding of the topic through questioning them on their mind maps – the idea of elaborative-interrogation. using this knowledge to then answer specific exams questions – supporting metacognition by discussing why they have answered the question in that way and then annotating their answer accordingly. This process is illustrated in the example above. The student has recalled the knowledge from memory and produced a mind-map, which has been further developed underneath, following questioning and discussion. This has then been used to frame a response to a related exam question, which has then been annotated, again following a discussion, with points that they would include to improve it further. English Language C1/section B: students have to write 450-600 words in 45 minutes (one draft only/unedited). Students do not read enough good models of creative writing/fiction. Students are doing many ‘mocks’ but not improving in areas like ‘having good ideas’ / ‘responding to the chosen title’. To tether them to a ‘good start’ and act as a springboard for their own writing. To model the writers’ methods, sentence structures, grammar, punctuation and vocabulary expected at a certain ‘level’ (GCSE grade 5+). To not show models of heavily edited/perfect (unattainable) pieces of writing. To structure each hour we spend on writing and cover key areas of the writing Knowledge Organiser. In order to achieve this, Kelly was inspired by Sam Atkin’s presentation from the last INSET day. 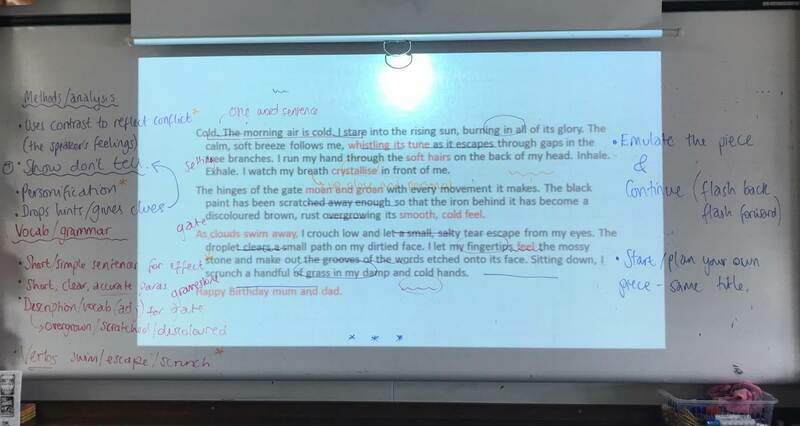 Sam talked about using a piece of stimulus writing that he would use to get students to think about and then produce their own piece of writing. Kelly adopted a similar approach. Emulate the style of the piece using a different character. Plan and start their own piece with the same title. Writing on right hand side is high quality and clearly emulates some of the strengths from the model. Knowing what ‘elaborate’ means, does not always mean knowing how to do it effectively. Modelling and practice were crucial. To make sure students have practiced enough in-class (as well as practicing peer and self assessment) so that they will be able to achieve something similar at home for revision. Becky Owen talked about the main challenge that is facing science teachers up and down the country at the moment – how do we get students to remember the huge amount of content (including over 20 physics equations) over the course of two years, in the new specification? Quick, low stakes quizzes at the start of all lessons. These include questions from previous topics, subjects (in terms of biology, chemistry and physics) and years. Maintaining this routine every lesson. The two examples above illustrate this approach. There are also some more subtle approaches within this. 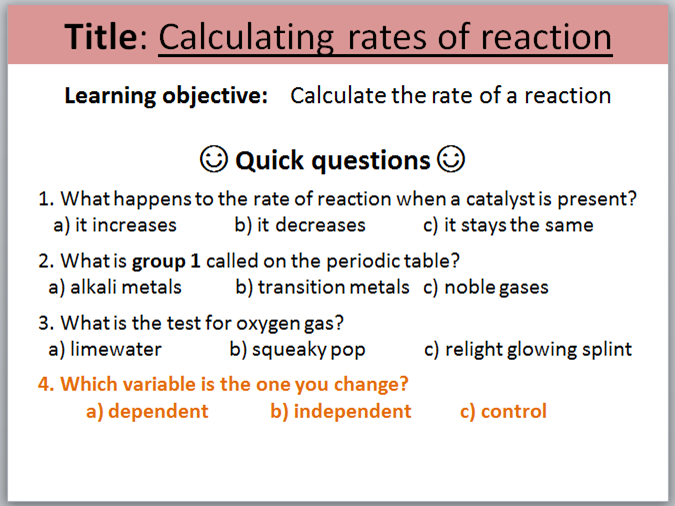 For example, in the first slide even though Becky is teaching physics, the second question goes back to biology, which is indicated by the question being in green. 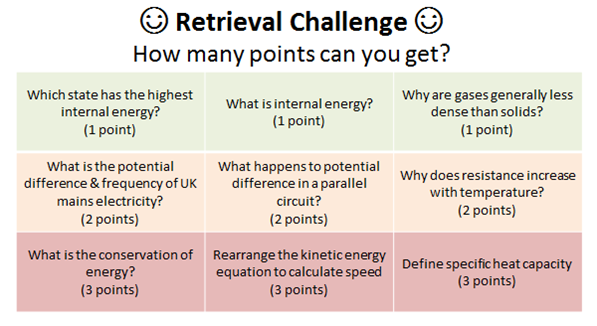 This reassures students that this is a question from another topic that was covered a while ago, so is going to present a challenge to students – and that this is OK.
Students then score a different number of marks (that aren’t recorded) based on their responses to different questions. This element of competition seems to be attractive for some classes, although Becky doesn’t use this all the time because firstly, it is more labour intensive than just asking questions and secondly it deviates a bit from the idea of a low stakes quiz. What it is useful for though is making you as a teacher think about a good range of questions. What has Becky noticed since adopting this approach? 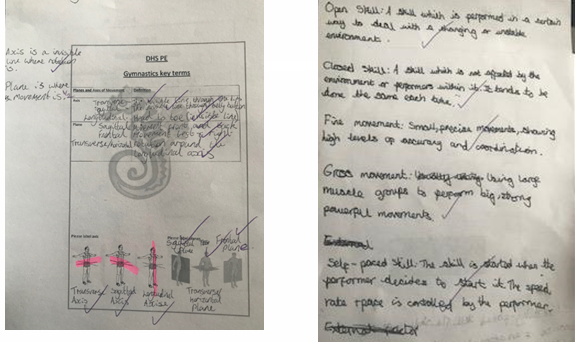 Regular low stakes quizzes have shown students how they are progressing, as they know themselves how much they can remember from previous topics. Having a routine at the start of al lessons has improved engagement and focus from less motivated students. 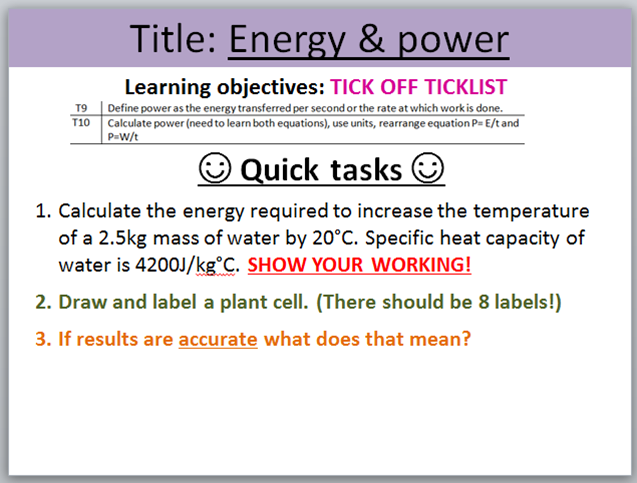 Students are able to recall key content quizzed on much more quickly. Next steps? Ensuring that questions that are regularly answered incorrectly are returned to at different points in the year. The final presentation was from Louise in PE. The PE department want their students to be using tier 3 vocabulary fluently, to support better written responses to questions. A common approach to this is by implementing a rushed intervention in Y11, involving lots of key-word lists, however, by this time it is probably too late. If we want students to be fluent with this vocabulary, we need to be embedding it in KS3. This is the approach that the PE department have adopted. Having identified the tier 3 vocabulary they want students to be using, they ensure that they use this in their teaching. One strategy they have employed is to subtly alter the way PE staff question students at KS3. Instead of asking students questions such as ‘what is an axis?’, Louise encouraged teachers to incorporate the vocabulary into the discussion. For example in a lesson a teacher might ask ‘what axis is the dancer rotating around in this movement’? This is important for two reasons: a) It puts the vocabulary in context, which is what creates meaning and therefore understanding, and b) it does not add to the workload of the teacher but rather enhances what they would have been doing anyway. You can read more about this here. Students have to learn the key words and definitions, and then be quizzed on their meaning. As a result of these approaches the PE teachers have found that when students get to KS4, they find recalling this core knowledge much easier and are using this tier 3 vocabulary more fluently. 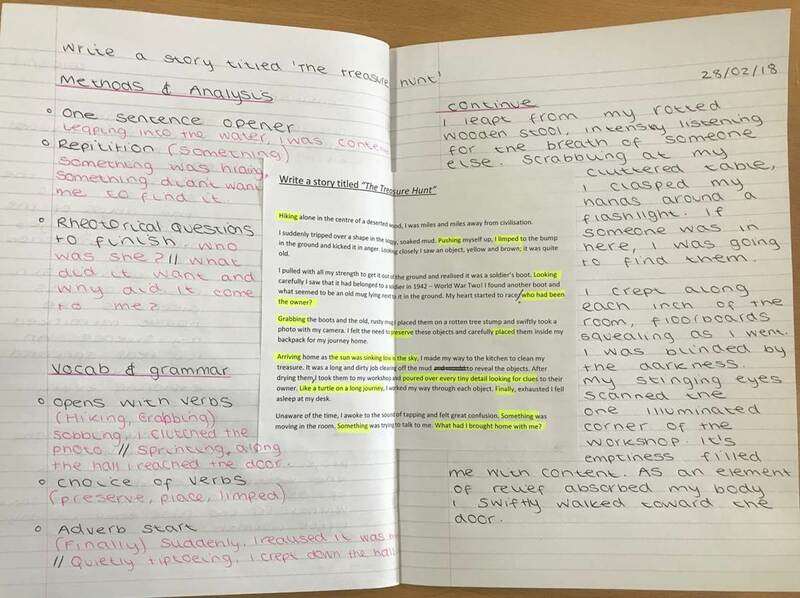 This entry was posted in CPD Events, General Teaching and tagged INSET, Modelling, Retrieval practice, Revision, Vocabulary. Bookmark the permalink.